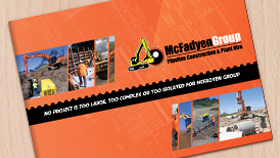 McFadyen Group - If you are looking for mini excavator hire in Brisbane, then McFadyen have got you covered. Give us a call today for prices and information. Are you looking for a mini excavator to hire in Brisbane? Then the McFayden Group have got you covered. We have a fleet of the latest reputable machines, consisting of the best brand names like Airman, Caterpillar and Doosan. McFadyen’s pipeline plant hire gives clients the best fleet of reliable, modern, and well maintained machinery anywhere at any time. We believe there is no job that McFadyen’s equipment can’t handle, and we ensure that regardless of the job at hand we have got your covered. We ensure all our machinery is well-maintained and stored correctly, to ensure the best service and equipment for your project. All our machinery is of the highest quality and is regularly serviced by our highly qualified fitters in our Brisbane yard and also at the project site, no matter what the location may be. Our dynamic team of highly experienced workers will make sure you’ve got the exact machine you need to complete your job at a great price. If you want to know more about McFayden’s services then please do not hesitate to contact us by phone or email. We are more than happy to answer any questions you may have or to provide you with a quote.